Frank Meisler (above) died in March 2018 at the age of 92. An internationally renowned architect and sculptor he enriched the world with his buildings and his works of art. Yet had others had their way his life would have been savagely curtailed in his teens. Meisler never forgot how he escaped death, those who made the journey with him and those who made it possible. He left behind a remarkable legacy so that we might remember too. In August 1939 Frank Meisler was a frightened 13 year old boy. As a Jew he was no longer safe in his home town, the Free City of Danzig (now Gdańsk in Poland), a German enclave which had embraced Nazism. There had been anti-Jewish riots and the city’s Great Synagogue had been taken over and demolished. 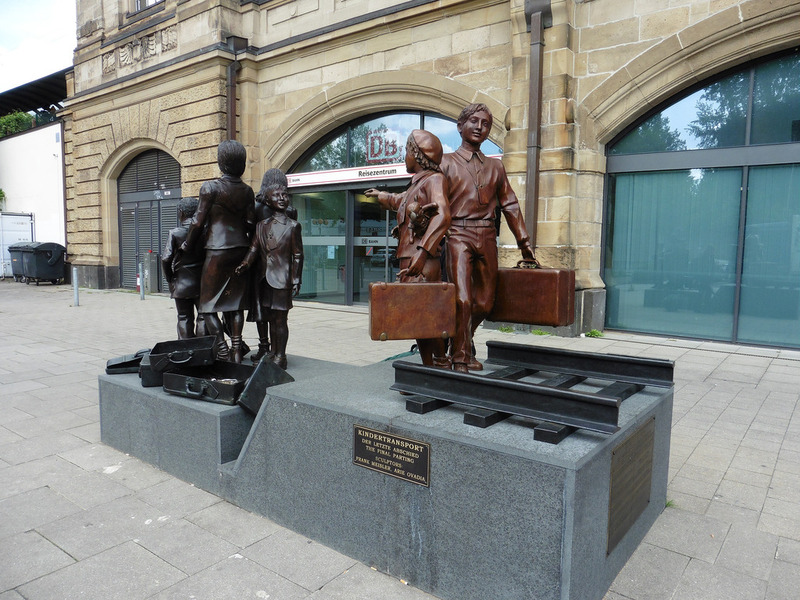 Desperate, his parents requested his evacuation from the city by the Kindertrasport (German, Children’s Transport) an organised rescue that took place just before the outbreak of the Second World War. Frank Meisler escaped to the UK. 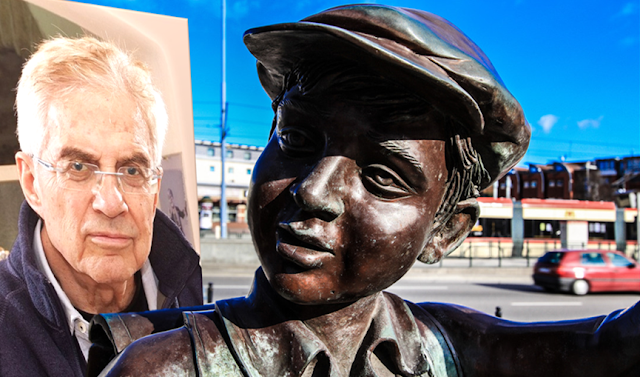 Seventy years later in 2009 he would return to his birthplace with his memorial dedicated to the children of the Kindertransport and those who had made their salvation possible. 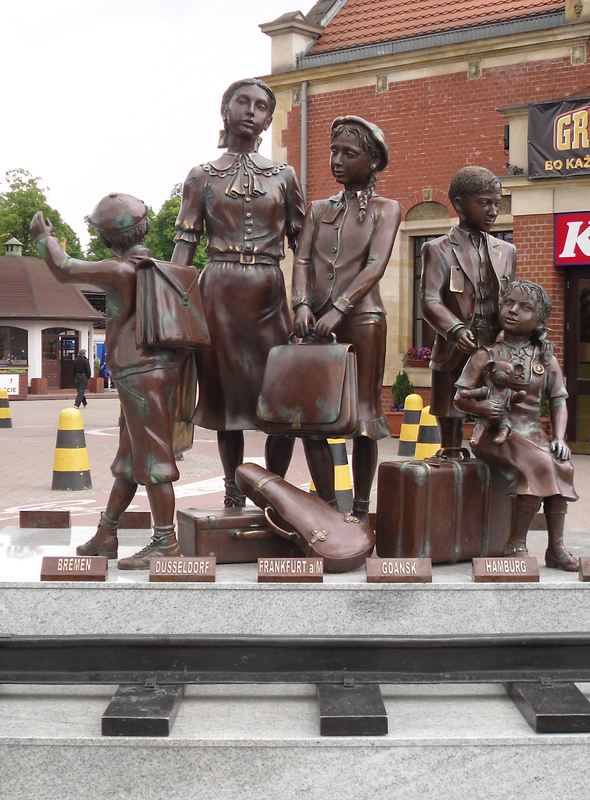 The railway station at Danzig was the start of a train journey which would take Frank, along with 14 other Jewish children, from their home town to the heart of Nazi Germany, Berlin. 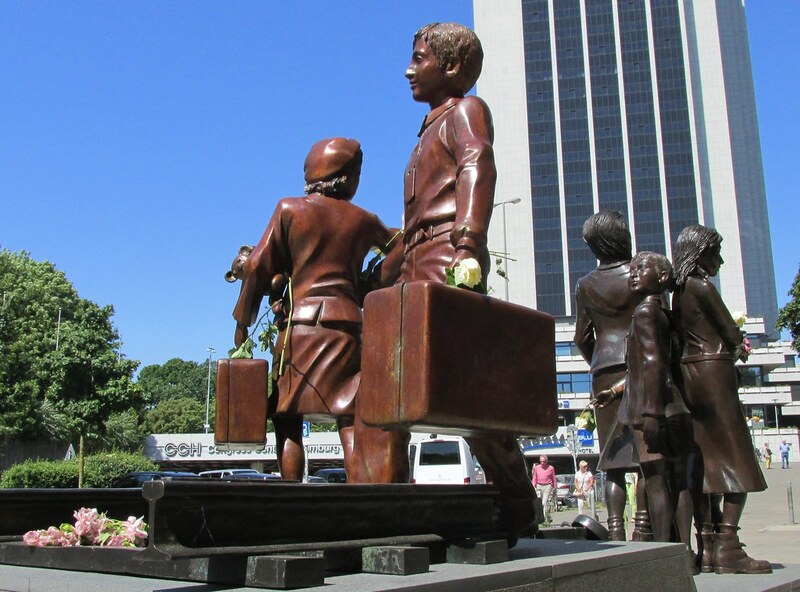 From there they would journey through Germany and on to the Dutch port city of Rotterdam. Thence a boat to freedom in England where another train would take them to London’s Liverpool Street Station and their new life would begin. Meisler would create monuments for all four places, plus Hamburg (as you will see below). Frank Meisler’s escape wasn’t a moment too soon. Germany invaded Poland on 1 September 1939 and Britain and France declared war against the Nazi state two days later. His parents were arrested three days after he left and held in the Warsaw Ghetto. They would later die at Auschwitz concentration camp. Meisler was taken in by his grandmother who lived in London. He was educated in the London borough of Harrow and went on study architecture at Manchester University. After finishing his national service with the RAF he started his career in architecture, helping to build Heathrow Airport. In 1960 he emigrated to Israel and spent the rest of his career there - and where his art flourished. 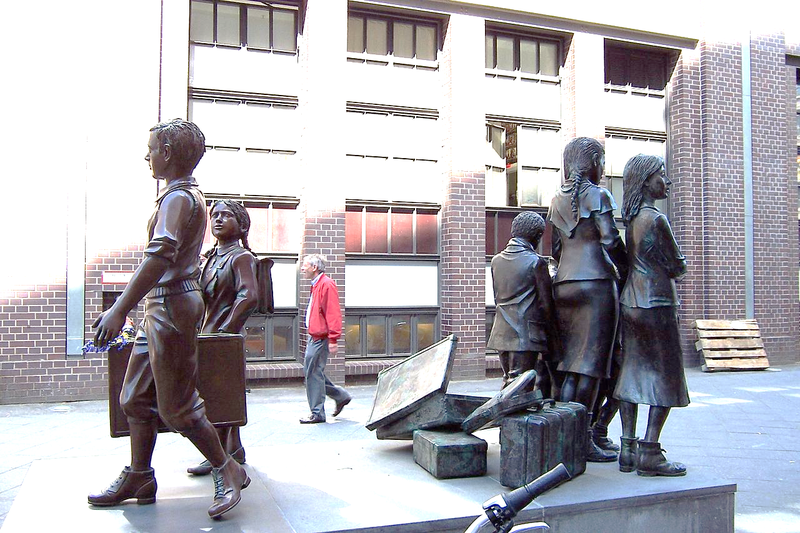 Meisler's first Kindertransport sculpture was unveiled in London in 2006. 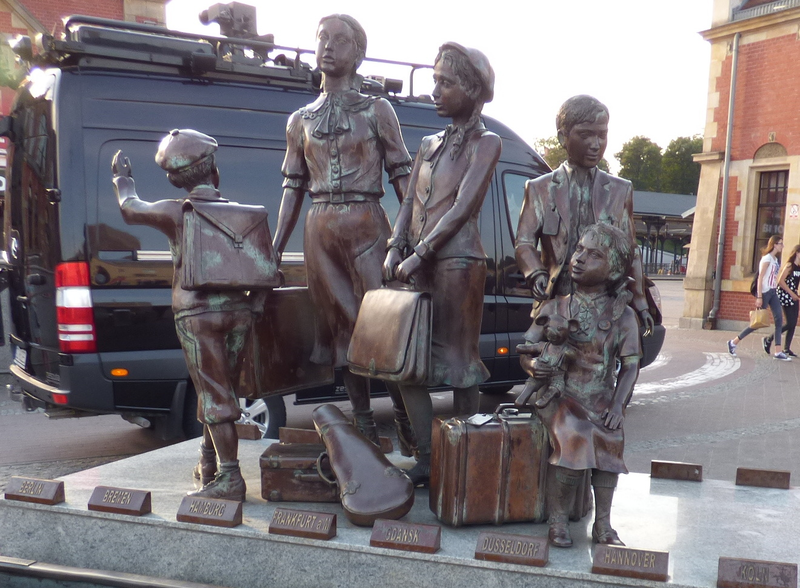 The others followed over the next decade, including the The Departure at Gdansk railway station, pictures of which you have seen above, in 2008. 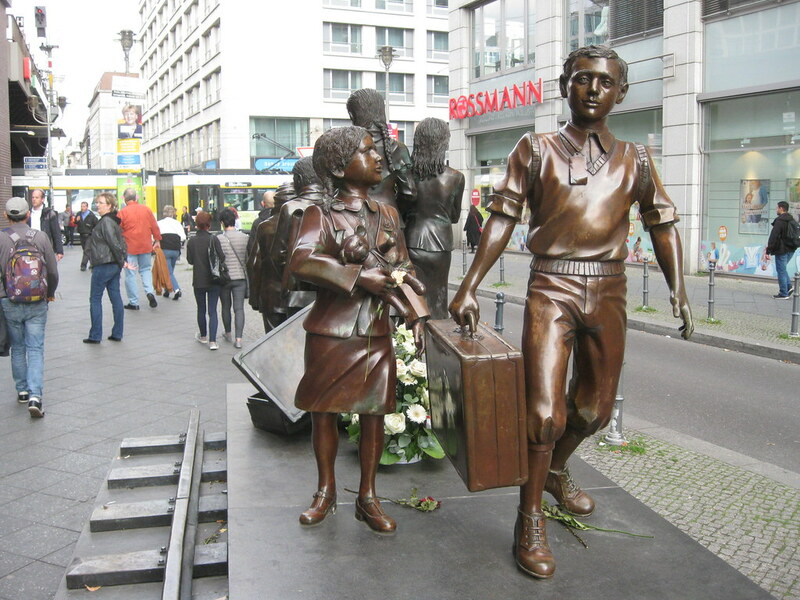 They have not been placed in order of creation, however, but in order of a journey from Gdansk – so next you will see Berlin, then Hamburg, Rotterdam and finally London just as Meisler would have done as a teenage refugee. So after Danzig, the next stop was Berlin. Meisler’s Berlin sculpture pulls no punches. 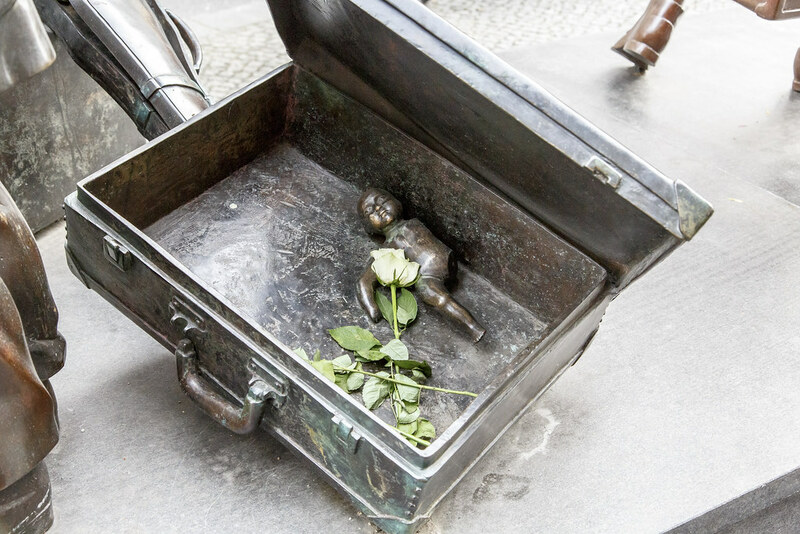 Two children stand for those saved, five children for those murdered – with the hue of the bronze for the two pieces markedly different; light for those who lived, dark for those who died. Almost 10,000 lived. 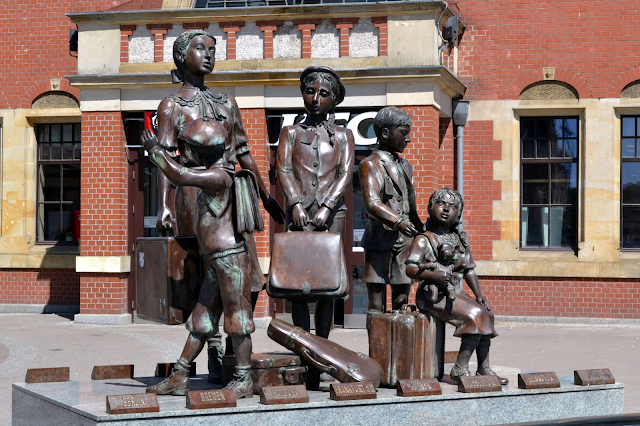 Kindertransport meant the free admission to the United Kingdom of unaccompanied minors. In November 1938 a massive pogrom against German Jews, which became known as Kristallnacht (Crystal Night) in reference to the shattered glass on the streets, precipitated a delegation to the British Prime Minister. 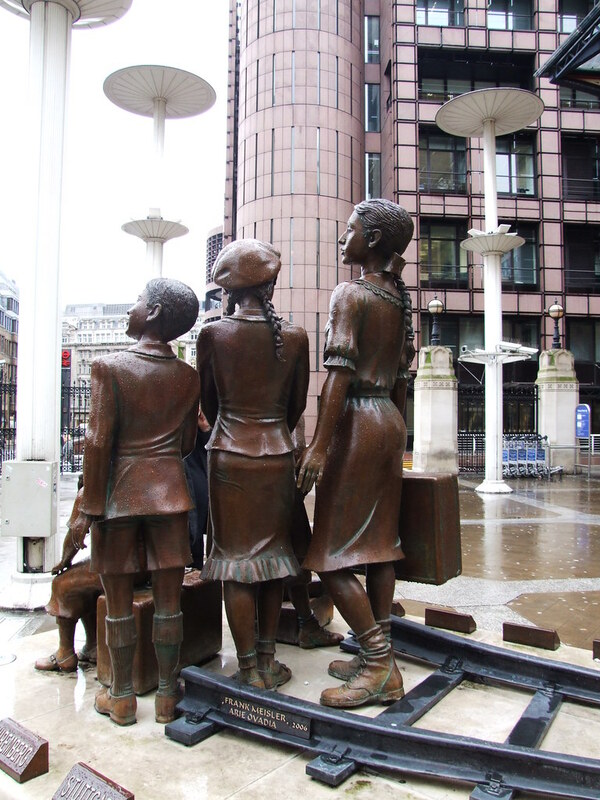 The members of the Movement for the Care of Children from Germany, later known as the Refugee Children's Movement committed to fund all of the children while they stayed in the UK and to additionally fund their future re-emigration. Within a week of the government agreeing to take in the children a radio appeal had secured the promise of 500 foster homes. 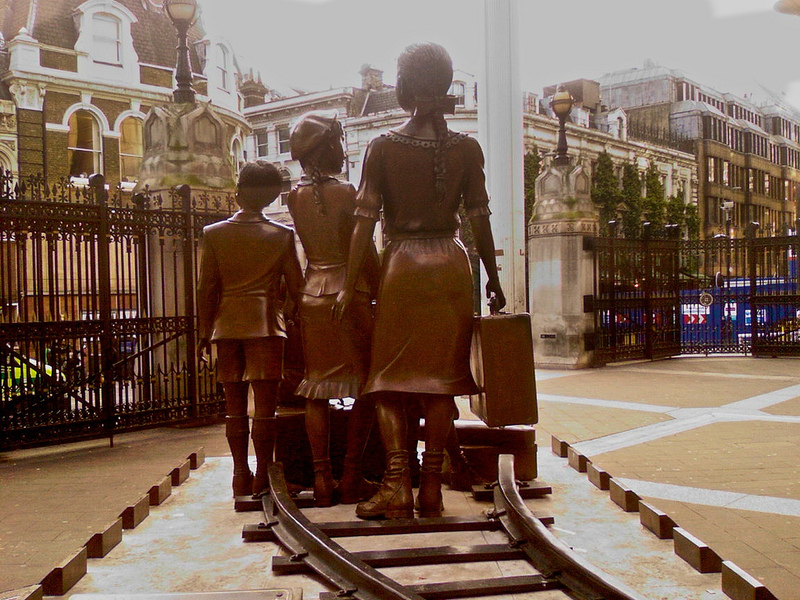 Kindertransport was on. A network of organisers was created in Germany and the children were selected from those families deemed most at immediate risk. 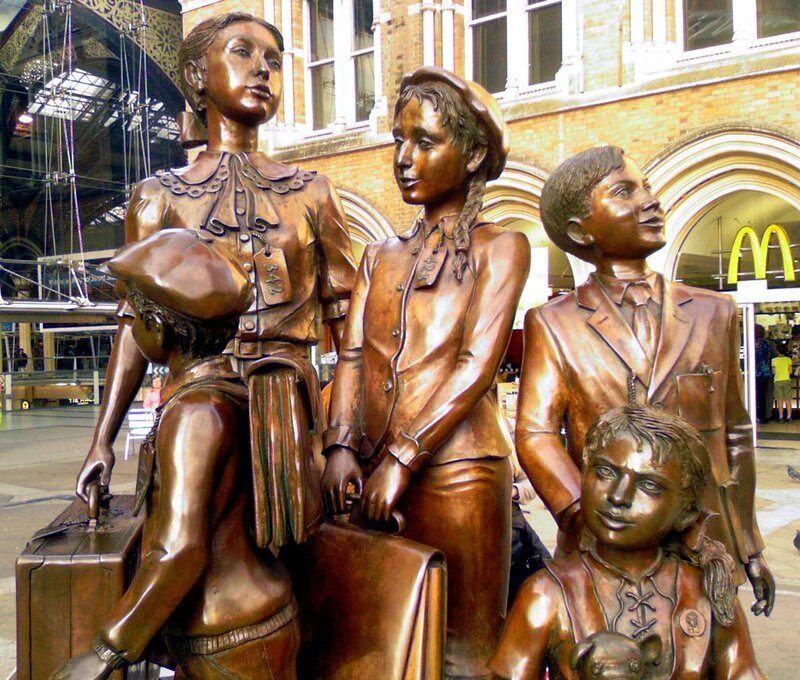 Amazingly the first transport of 200 children arrived in England just three months after Kristallnacht. The majority of the children who made up the first party were from Jewish orphanages burned down by the Nazis. 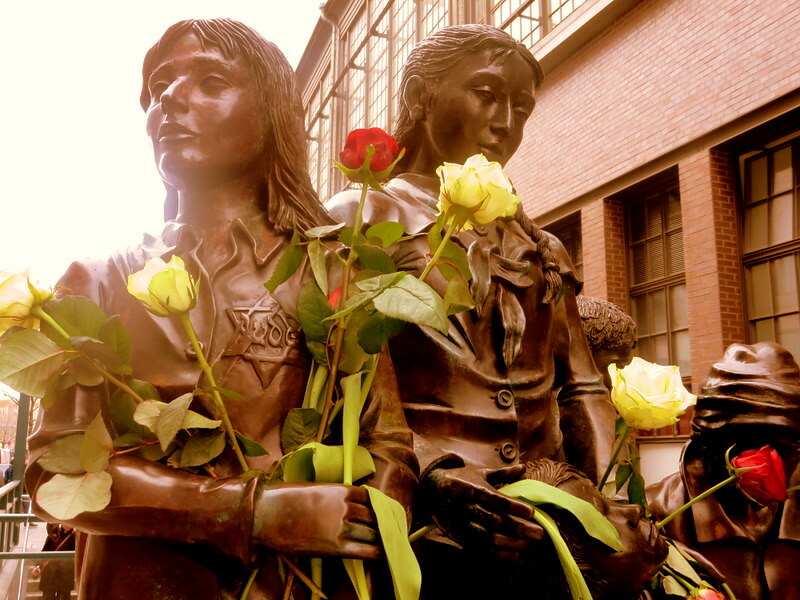 In Berlin, flowers are regularly placed on and around the monument. 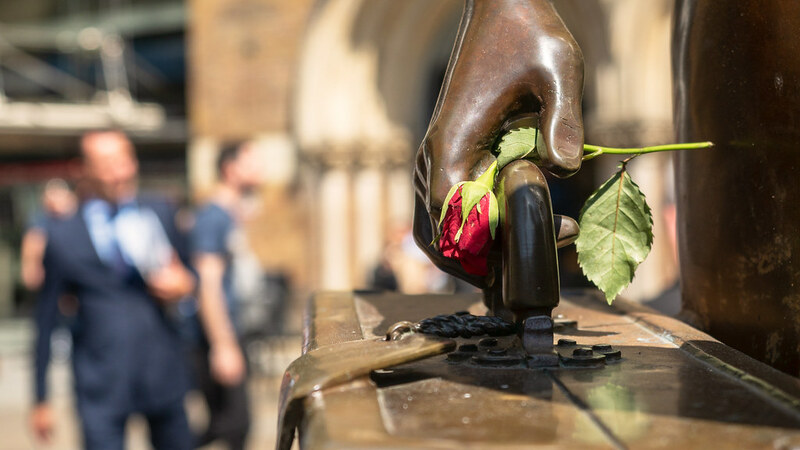 You might not need to guess on which part of the sculpture most of the flowers are left. 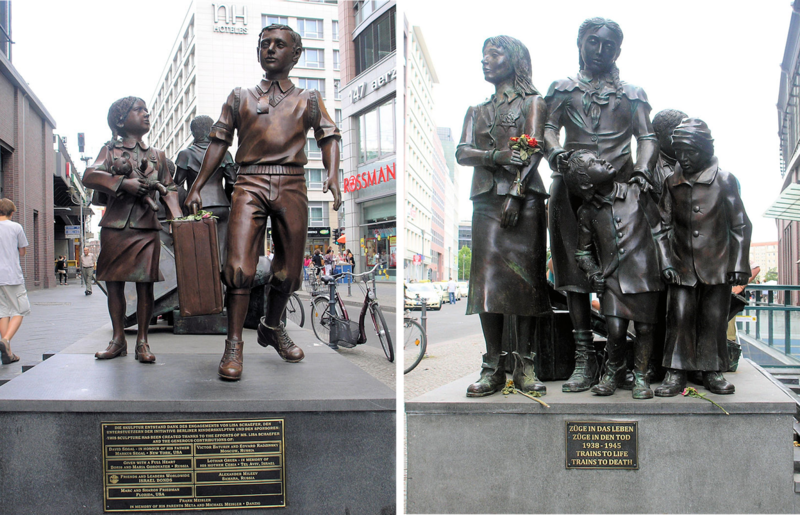 In Hamburg, Meisler continued the visual metaphor of the different fates experienced by Jewish children from 1938 onward. 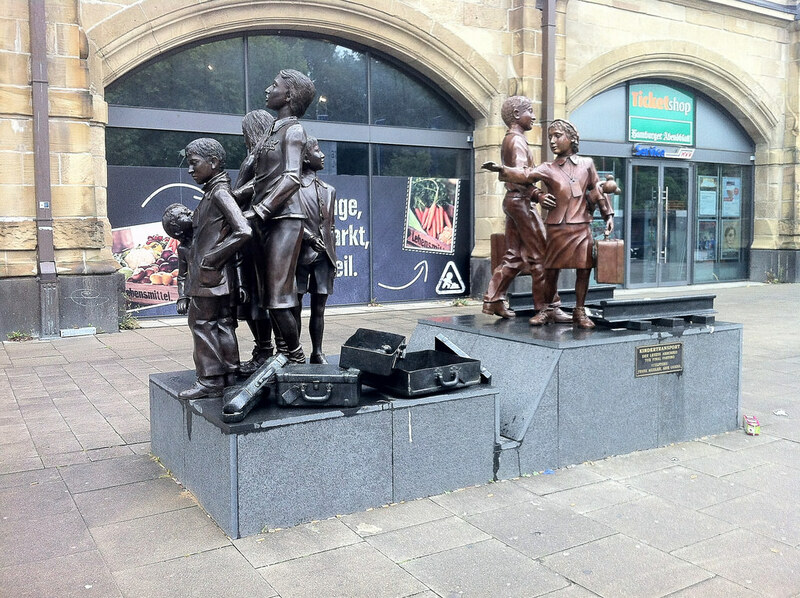 The fortunate two, here again in lighter bronze, go in the opposite direction to the others whose meager suitcases are discarded on the ground as they walk to the train that will transport them to their deaths. A girl is unwilling to part with her friend but is gently moved on and away by an older boy. Although this did not – could not have – happened in real life due to the (albeit short) difference in time it makes one imagine that these emotive images must have formed in Meisler’s mind many years before being cast in bronze. 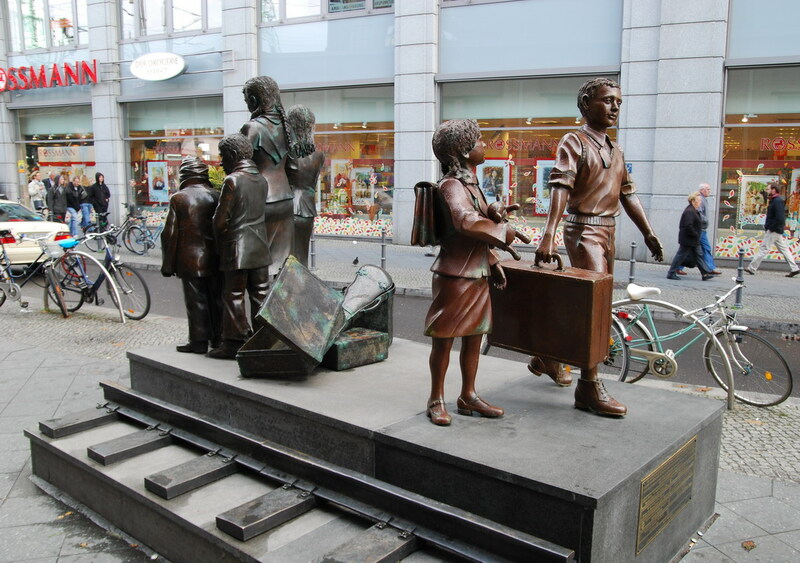 The children of the Kindertransport came initially from Germany and Austria. Many would have started their journey from or gone through Hamburg on the way to their various destinations. 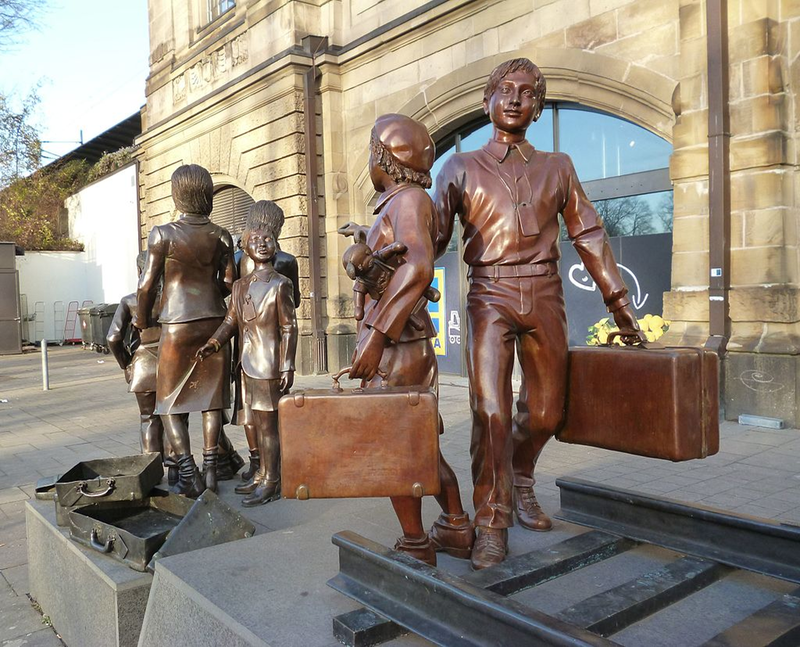 When the German army entered Czechoslovakia in March 1939, the Kindertransport hurriedly evolved to include children from there, Poland and Meisler’s home, the Free City of Danzig. The older children take the lead, guiding the younger ones. Even after Meisler arrived in England the war would last another six long years. This was long enough for some of those older children to reach young adulthood and many of them would go on to help the war effort. Some served in the armed forces, others in nursing and food production. Yet for now they had to get there. The next step on many of their and Meisler’s journey was the Netherlands. Meisler would by now have been given a numbered identity card. As well as particulars about himself the card bore the message: “This document of identity is issued with the approval of His Majesty's Government in the United Kingdom to young persons to be admitted to the United Kingdom for educational purposes under the care of the Inter-Aid Committee for children. This document requires no visa.” Card in hand he was able, with his 14 companions, to board a ship bound for the English port of Harwich. 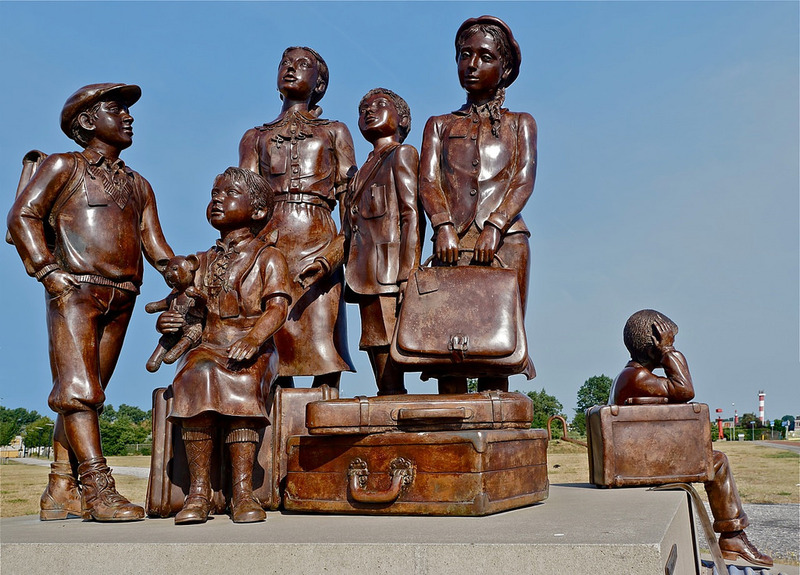 By this point in the journey there is no doubt that some of the younger children would have become unsettled. They would have realized that they were not going to see their parents again for a long time. Most, including Meisler, would never see them again. 10 May 1940 saw the invasion of the Netherlands by the Germans. 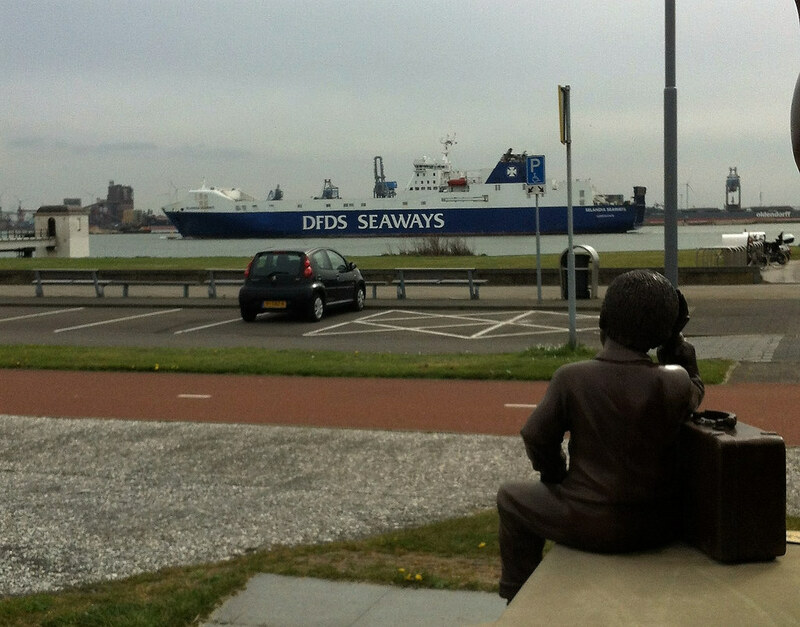 There was a ship in the port of Ijmuiden which was due to leave carrying 72 children. On 14 May it managed to leave the harbor at some speed just as the German army entered the port. 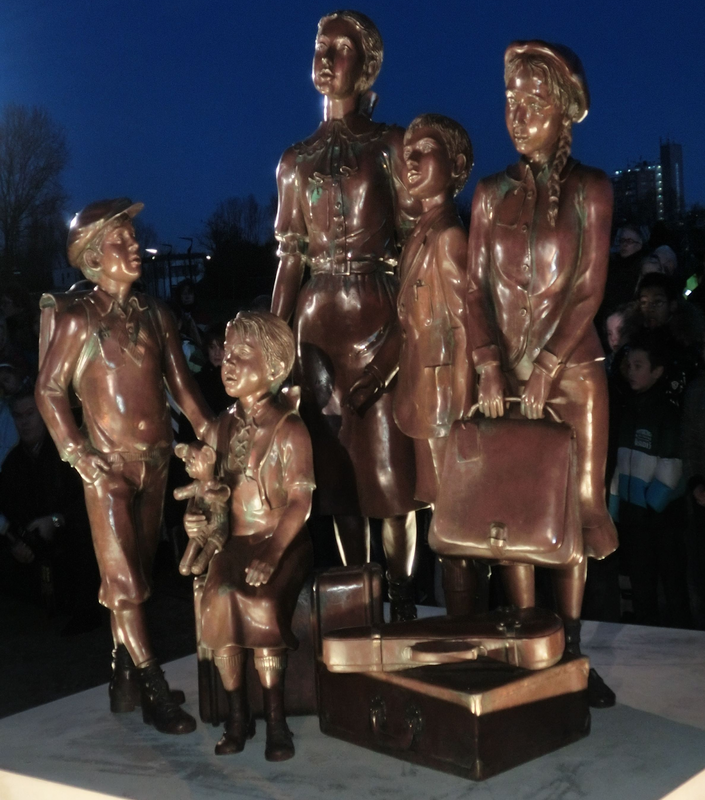 The defeat of the Netherlands was the end of the Kindertransport. There were a number of children already in transit in various European countries who never made it to the end of their journey to freedom. The previous August, Frank Meisler would have seen the mainland of Europe recede at a much more leisurely pace. On arrival in England there was yet another train to catch - this time to London and Liverpool Street Station. The war would last longer than anyone had imagined and Meisler would settle in England until leaving for Israel in 1960. 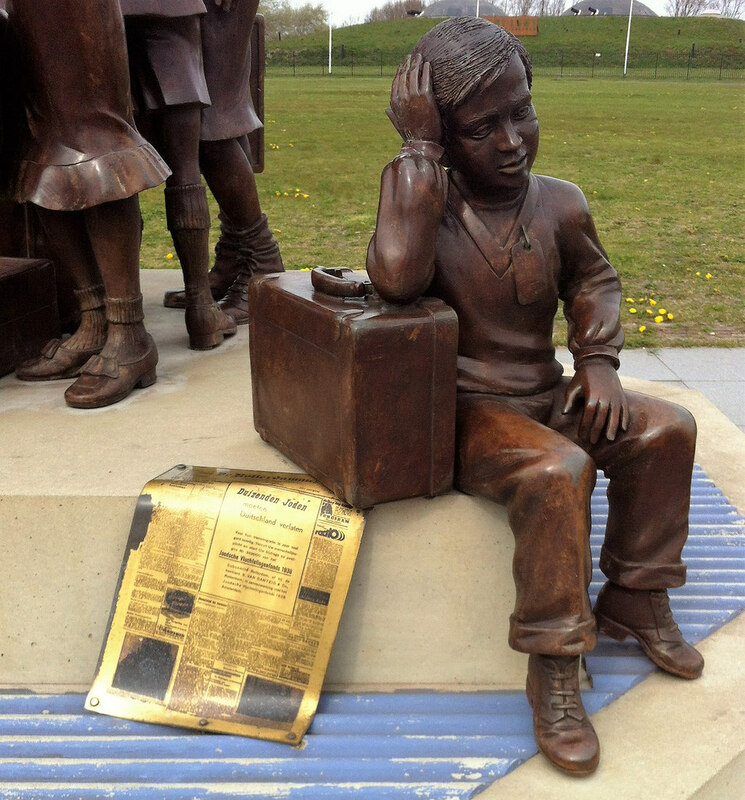 His new life in the United Kingdom took a different route than that ordained for him by Europe’s new (and thankfully temporary) overlords, as did those of the other 10,000 children rescued from almost certain death by the Kindertransport mission. He would remember them in bronze.